The massive growth in popularity of mobile phones, social networking and apps is the most significant paradigm shift in communication since the dawn of the internet. In the past year alone, the number of mobile uers worldwide grew to 6 billion - that's 87% of the world's population. More than 300,000 mobile apps have been developed in the past three years. 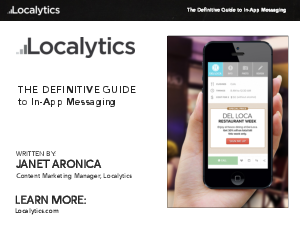 But according to Localytics data, based on usage of more than 750 million devices we analyze through our mobile app analytics and marketing platform, shows that 22% of apps are only used once. with data limits and an abundance of options to choose from in the appstore, there are high expectations for mobile app experiences and no shortage of options to meet those desires. Download this eBook to learn the right way to engage users with mobile app marketing with the best practices of in-app messages.